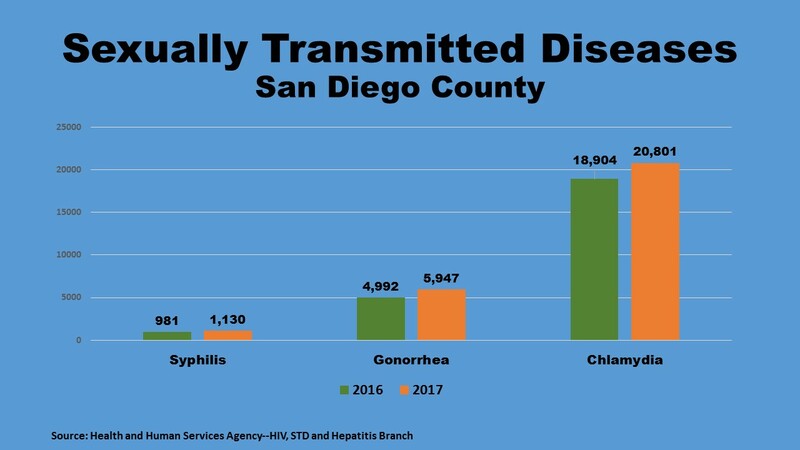 Cases and rates of syphilis, gonorrhea and chlamydia in San Diego County continued to rise for the third consecutive year in 2017 and were at the highest level in the last two decades, new data from the County Health and Human Services Agency reveals. Syphilis passed from mother to baby is also a major concern. The County has implemented programs, such as Don’t Think, Know., a free home testing program for gonorrhea and chlamydia available to women 25 years old and younger. The program can be accessed by visiting or by calling (619) 692-5669 (619-692-KNOW).